There is never a perfect time for a fresh resolution. Despite the sincere sentiment on the brisk eve of January 1st while you rapidly log your New Years Resolutions, our ‘fresh start’ is really a string of valiant attempts to change our behavior or our habits, which generally last only 2-3 weeks in January… of the same year. Though my peers might glare at me with agony, since 24 hours is more than enough for them, I am left feeling defeated and exhausted; I know you can relate. What do I do when I feel hopeless and uninspired? I simply look to those individuals who are far busier than I am, and I observe what they do to produce an effective time-management schedule. After studying the routines of the big-time CEOs in business, I found that each of them follow a simple routine throughout their day in order to put their best foot forward in both business and life. While I feel that including the names of each CEO and detailing their daily routine will defeat the purpose of making these habits your own, I have taken a general survey of the top 7 habits of big business CEOs and I have listed them below with brief tips and tricks to implementing these habits into your daily schedule. Habit 1: They wake up early. That’s right, folks. ‘The early bird catches the worm’ according to English historian William Camden. You will catch the worm if you delve into your morning routine as early as possible. By worm, I mean efficiency… ‘The early bird catches efficiency’ is the revision I am proposing. After reviewing the morning routines from the most successful CEOs, as listed on Forbes, Business Insider, and Huffington Post, I have found that the average CEO rises at the wee-hour of 5:00 AM. Though 5:00 AM may sound extremely early to all ‘lovers of sleep,’ it pays off in the long run when your schedule becomes significantly more manageable. The power of the morning is often lost on those of us who maintain shut-eye past 6:30 AM. If you want to catch an edge on your competition, morning-time is the golden ticket. Habit 2: They muster up a healthy breakfast and actually eat it. The old adage: ‘Breakfast is the most important meal of the day’ is very true. I personally despise breakfast, though I do not consider bacon a breakfast food, I consider it a ’round the clock nibble. The thought of a mandatory meal in the morning augmented my anxiety to heights I didn’t comprehend were possible. However, each and every CEO that was interviewed about their morning routines, emphasized the importance of breakfast. So, I tried it. I kid-you-not it completely improved my energy throughout the day; no longer do I need 3 cups of coffee in the morning to reach maximum productivity. A simple non-fat yogurt, sprinkled with blueberries, honey, and protein granola has done the trick! Don’t even think about skipping breakfast, or your efficiency will suffer. Habit 3: They are constantly informed about the world. Ignorance is not bliss when it comes to business. How can you manage a business if you are not fully equipped with knowledge of your industry or competitive industries? You can’t! The top businessmen and businesswomen in the world spend at least 30 minutes to 1 hour of their morning reviewing the ‘hot’ news online or in the paper. No need to subscribe to 4 different newspapers; that is a complete waste of your hard-earned money. If you take 10 minutes RIGHT NOW, however, to bookmark some of your favorite industry news sites and you take time to review the headlines every morning, you will enter the workplace with a plan of attack as opposed to an unprepared and inefficient defense. Habit 4: They meditate, pray, and center themselves for the day. Fortunately, meditation and religion are completely disassociated, though some people who meditate participate in religious practices and some religions implement meditation. A minority of the powerhouse CEOs participate in religious practices, but the majority of them implement meditation into their daily routine. Why is this? Because meditation is an excellent way to center your inner self prior to engaging with the outside world. A centered mind serves as a catalyst to greatness. Find a quiet place in your home, out on a balcony, or in your backyard. Use iTunes radio to find a meditation playlist, or you can create one from your iTunes purchases. If you choose to sit down, make sure your feet are planted on the floor and your palms are facing up on your lap; if you choose to lay down, sprawl out in the ‘corpse’ yoga pose. Start your meditation by focusing on your breathing. Take a deep breath in, then exhale slowly until your lungs have released all of the air to the Earth. Avoid using a timer in your meditation, allow your body to engage in the breathing as long as you desire (your meditations will initially be quite brief, and as time goes on they will increase in length). Avoid meditating in bed… We all know how that goes. Habit 5: They map out their days before they actually start their day. Mapping out the 24 hours ahead allows an individual to solely focus on the tangible (or intangible?) tasks for the day; there is no need to map out your entire week on Monday, though it may be helpful to log your appointments as they arise in a cloud calendar so you have it at all times. If Richard Branson the CEO of the Virgin Group was to map out his entire week on Monday, do you think he would be as efficient in business management and as calm as he appears to be in interviews? Absolutely not! If we monitor the 24 hours ahead, we provide ourselves with a manageable task list for the day. Starting fresh every morning may be the ultimate key to your success as a business owner. I find that designating a fancy-looking notebook (from Target or Ross, so maybe not so fancy) to my ‘To Do Lists’ is the best way to prevent both losing my task list and also visualizing my day in its entirety. For those of you who solely utilize technology for all personal and business management, you can use Evernote or Google Tasks in Gmail to create your list. Habit 6: They disconnect on the weekends. You can rarely enter a residence or a business without literally running into someone face-down in their smartphone. The advancements of technology have far exceeded everyone’s expectations, and the excitement surrounding the tech industry is quite contagious. However, even the tech geniuses need a break ever so often. Tim Cook the CEO of Apple ensures that he budgets for time spent away from technology, and this is the CEO of the biggest tech company in the world. Detoxing from your tech addiction is crucial to ensuring productivity during the week. Whether you designate ‘tech time’ on the weekend, or you simply remain abstinent from your laptop altogether, disconnecting from the Internet for a set period of time will only elicit positive results. Habit 7: They make time for exercising on a nearly day-to-day basis. This common extracurricular among all of the top CEOs threw me for a loop. I wouldn’t have imagined that exercising was on Howard Schultz’s priority list, let alone his top priority every morning; but, Schultz and his fellow big business leaders make exercise mandatory on a daily basis. Pick up any business or leadership book at your local bookstore and I guarantee that you will find a section if not an entire chapter dedicated to ‘moods in the workplace.’ What you put into the universe, you receive two-fold; if you treat your coworkers or your subordinates with disrespect and harshness, you are guaranteed to receive much of the same back. Exercising is like a happy pill. The likelihood that the perception of your day will be positive and uplifting is much higher when you take a happy pill in the morning. Plus, you will remain in shape and healthy, which also makes us happy. I think it’s time to start taking that happy pill every morning, what do you think? Before you completely revolutionize your schedule to include the 7 habits of highly efficient leaders, you must comprehend the following: NOTHING CHANGES OVER NIGHT. Do not expect to make all of these changes immediately; you must slowly introduce your body (and your family) to these changes in order to maintain stability. Start by setting your alarm clock 15 minutes earlier. Instead of cooking yourself a gourmet breakfast tomorrow morning, start with a yogurt parfait or a bowl of instant oatmeal. While you’re waiting for your coffee to brew, instead of running around the house trying to find things, sit down and work on your breathing. Take little steps for the week, then set your alarm 15 minutes earlier than you did the week before. Take a little more time on breakfast. Go outside for 5 minutes and work on your breathing outside. Then week three, you can work on your morning schedule a little more. It takes time, but it is completely worth it. 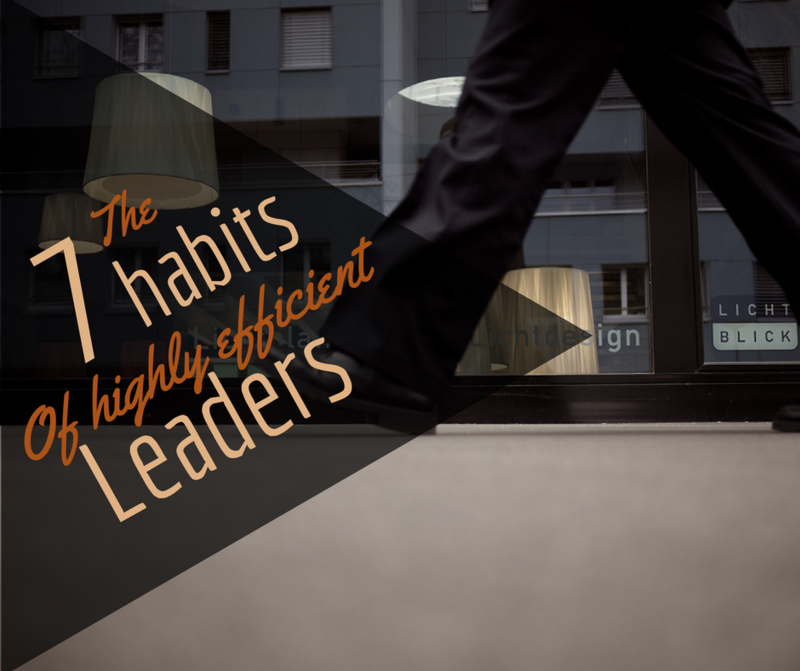 When implementing these 7 habits of highly efficient leaders, share your little quirks with me! Let me know what YOU have done to make these common habits even more efficient for time and business management. You can never have too many self-help tips, and we never stop learning. Brilliant advice, thank you for sharing!